Take 1 softgel daily with food or as recommended by a nutritionally-informed physician. 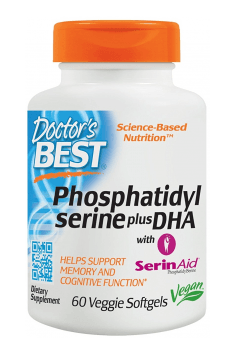 A standard dose of phosphatidylserine is 100 mg, taken 3 times a day. It is believed that the dose of 300 mg per day may turn out to be exceptionally effective with the aim of prevention of the drop of cognitive functions, which takes place with age, however, taking 100 mg per day will also bring some benefits. Supplementation with the preparation may turn out to be especially helpful, e.g. when we need to acquire a lot of knowledge in a short period of time. SeridAid (other name Phosphatidyl serine) compound belonging to the phospholipids present in natural form in the brain, and soy milk, it is an activator of protein kinase C (an enzyme localized in the brain), acting positively on the nervous system (improves the functions of cognition and memory and concentration), increases the ability to receive external stimuli and intensifies the process of information processing. Phosphatidyl serine used in food reduces the level of the hormone cortisol located in the catabolic muscle, affecting adversely the metabolism, resulting in a decrease in muscle mass and fat gain. The use of Phosphatidyl serine affects the rate of convalescence, recovery after injuries and maintaining psychophysical condition. Formulations containing Phosphatidyl serine are rarely used due to their high price. SerinAid is a component of certain dietary supplements used by athletes and people with mental activity, available at www.muscle-zone.pl.